Each year, new toys comes out and every year, we are mesmerized by the new gadgets. While DC Comics Pawzplay may not be a “gadget,” they are still something that stands out from the crowd due to the popularity behind Cosplay. If you are into cosplay, or know someone that is, then you might be interested in DC Comics Pawzplay. Looking online, there may not be a whole lot of information in regards to Pawzplay, but that is because it is fairly new. Today, we are here to tell you what we know about Pawzplay. First, we would like to introduce you to DC Universe. Surely, you’re familiar with DC Universe – right? If you’re not, your children probably are. DC Universe is a fictional universe that you find in most American book titles that have been published by DC Comics. This includes Superman, Batman, and Wonder Woman – they are from that universe. This universe also contains popular super villains, like Lex Luthor, Joker, and Darkseid. Now, we would like to introduce you to Cosplay. Cosplay …what can we say about it? Long story short, cosplay is a contraction of the words “costume play.” Participants of this performance art are called “cosplayers.” Cosplay is for both male and females. Cosplayers wear fashion accessories and costumes in order to represent a specific character. Favorite sources include anime, manga, cartoons, comic books, live-action films, television series and of course, video games. Cosplay is a hobby that started back in the 1990s and since then, there has been a rapid growth in the number of cospayers. During fan conventions, cosplay events are a common feature and there are a number of international competitions. If you plan on dressing up as a character from DC universe, some of you aren’t going to be complete without a lovely companion by your side – this is where the Pawsplay dog and cats come into play. Now, it’s time to be introduced to DC Comics PawzPlay! Each year, Factory Entertainment releases some amazing new items to introduce at the Toy Fair and their recent introductio was “PawzPlay.” What is PawzPlay? PawzPlay is a line of plush figures that mashes up your pet and cosplay. With cosplay, you have cats and dogs dressed up as your favorite DC villains and heroes. 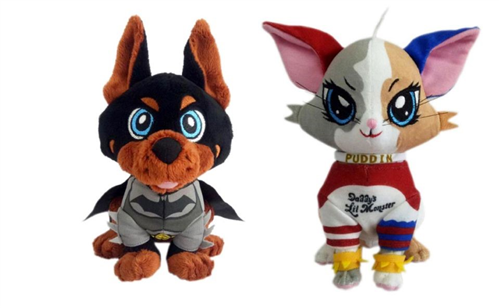 If you’re an avid cosplayer, then these cute pets are something you will want by your side as they’re really adorable. Cosplayers are really going to want to buy these because they’ll feel their costume isn’t complete without them. Besides, who could walk past a cute plush dog sitting next to a DC character?